It can be difficult diagnose white grub damage, since it can often appear as other lawn issues. However, there are some definite hallmarks of white grub activity. Being able to recognize symptoms of white grub damage and thoroughly inspecting your lawn will be vital to your white grub control efforts. Grass with damaged roots will begin to thin, yellow, and die. Irregular patches of brown grass will appear in random places in your lawn. Grass will feel very spongy, and will pull up very easily. Since the roots are damaged, turf will often roll up like carpet. Grass will be very vulnerable to drought and other stressors. Another sign of the presence of white grubs in your soil is an increase in activity of raccoons, moles, and birds digging in your turf, and even certain wasps flying low to the ground in your lawn. 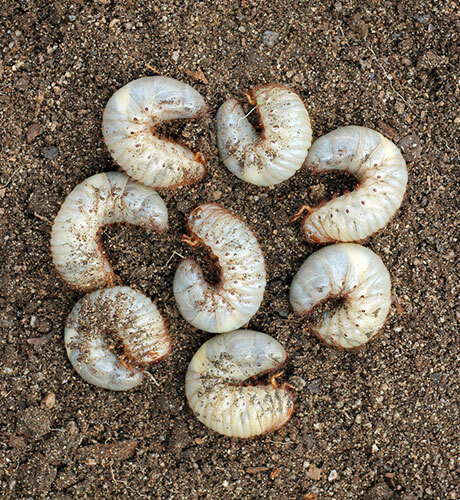 However, these animals also eat other insects and earthworms in the soil, so you should still inspect your turf/soil for the grubs before treatment to make sure you have white grubs. If you suspect you may have white grubs in your soil, an inspection may be needed. A few grubs in the soil is normal and your grass should be healthy enough to withstand a few them feeding on the roots. If there is a lot, corrective action should be taken. Survey the suspicious areas in your turf. August and September are good times to inspect because the grubs will be active and close to the top of the soil. Start by using a spade or garden shovel to cut square foot section of turf, about 2-4 inches deep in several different areas. Pull back the square foot area to expose the soil below. Closely inspect the turf, thatch, and soil for grubs. Generally, less than 5 grubs per sample is a normal amount that doesn’t warrant control measures. More than 5 grubs per soil sample is enough to require control measures. Replace squares of sod and pat down. Water in patches to avoid drying. And it’s that easy with the expert help from Do My Own Pest Control dot com! Subscribe to our channel for more DIY and product videos! Survey the suspicious areas in your turf. August and September are good times to inspect the turf because the grubs will be active and close to the top of the soil. Start by using a spade to cut square foot sections of turf, about 2-4 inches deep in several different areas. Pull back the square foot area to expose the soil below. Closely inspect the turf, thatch, and soil for grubs. Generally, less than 5 grubs per sample is a normal amount that doesn't warrant control measures. More than 5 grubs per soil sample is enough to require control measures. Replace squares of sod and pat down. Water in patches to avoid drying. 228 of 232 people found this article informative and helpful.